INSIDE MEN'S HOCKEY BY PAUL CAPOBIANCO @BadgerMHockey Scheduled events » The celebration gets underway with Wisconsin's first regular-sea- son home game on Nov. 2 when the Kohl Center ice gets dedicated and officially named "Bob Johnson Rink." Other special nights include 1973 NCAA Championship Night on Jan. 25 and 1983 NCAA Cham- pionship Night on Feb. 8. The pro- gram will be celebrating the 40th and 30th anniversaries of Wiscon- sin's first and fourth NCAA titles. 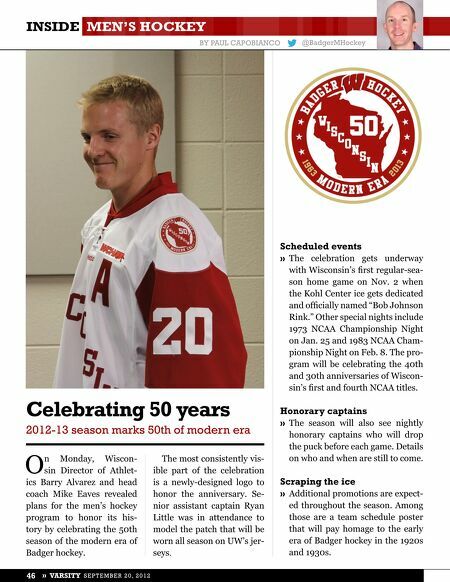 Celebrating 50 years 2012-13 season marks 50th of modern era O n Monday, Wiscon- sin Director of Athlet- ics Barry Alvarez and head coach Mike Eaves revealed plans for the men's hockey program to honor its his- tory by celebrating the 50th season of the modern era of Badger hockey. 46 » VARSITY SEPTEMBER 20, 2012 The most consistently vis- ible part of the celebration is a newly-designed logo to honor the anniversary. Se- nior assistant captain Ryan Little was in attendance to model the patch that will be worn all season on UW's jer- seys. Honorary captains » The season will also see nightly honorary captains who will drop the puck before each game. Details on who and when are still to come. Scraping the ice » Additional promotions are expect- ed throughout the season. 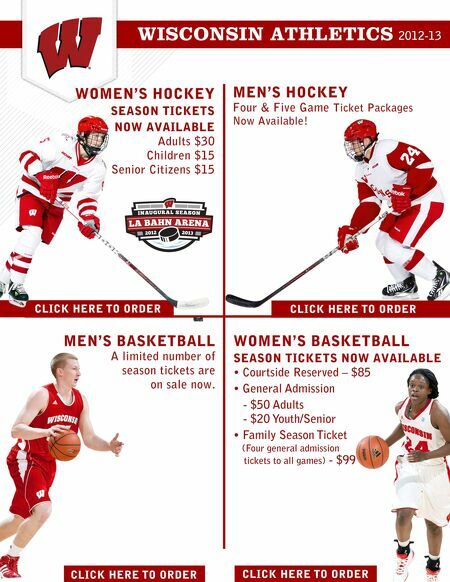 Among those are a team schedule poster that will pay homage to the early era of Badger hockey in the 1920s and 1930s.